This is the latest in a range of accessories sets from IMEX, and this time the focus is on the Battle of the Alamo. 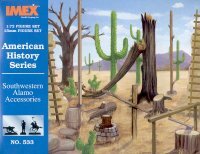 The pictures of the components largely speak for themselves, with the set containing dry and dead trees, cacti, a flagpole, several sorts of scaling ladders, a well, some barrels, a hitching post, a tree stump and various piles of stones and tufts of grass. Clearly the emphasis is on a dry landscape, so many of these would be equally useful for many scenes of the American West. 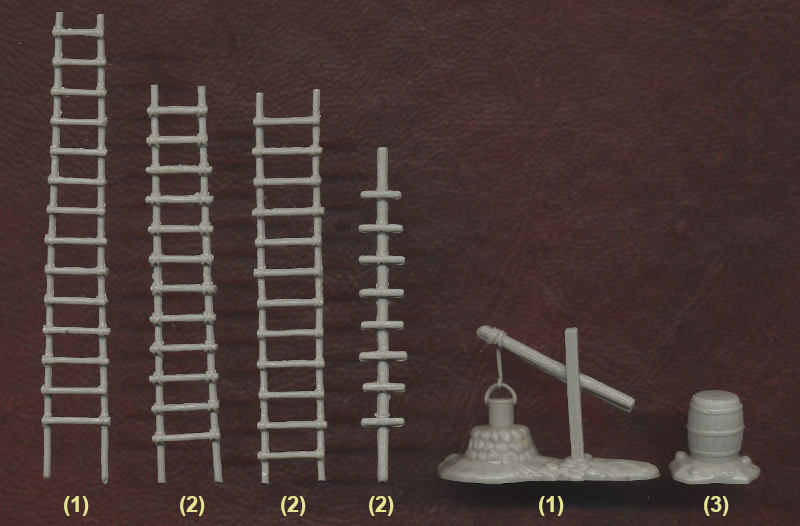 The scaling ladders are perhaps the most obvious accessory specifically for the Alamo, but all the items add something to a diorama. Every item has been well sculpted and seems authentic. Both the large and the very small cacti look reasonable, the well is a very nice piece, and so too is the chopping block with the axe. 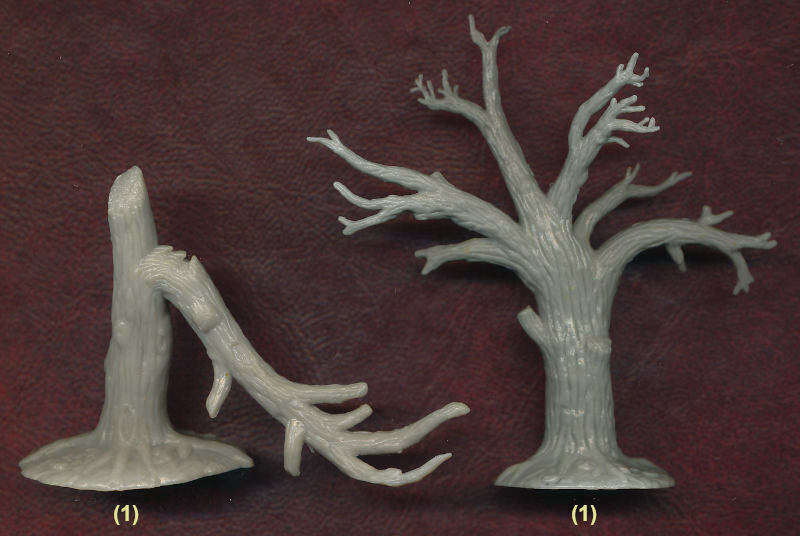 The trees are of course the most dramatic item in the set, and look impressive, though both are inevitably fairly two-dimensional (not really a problem for the broken tree). 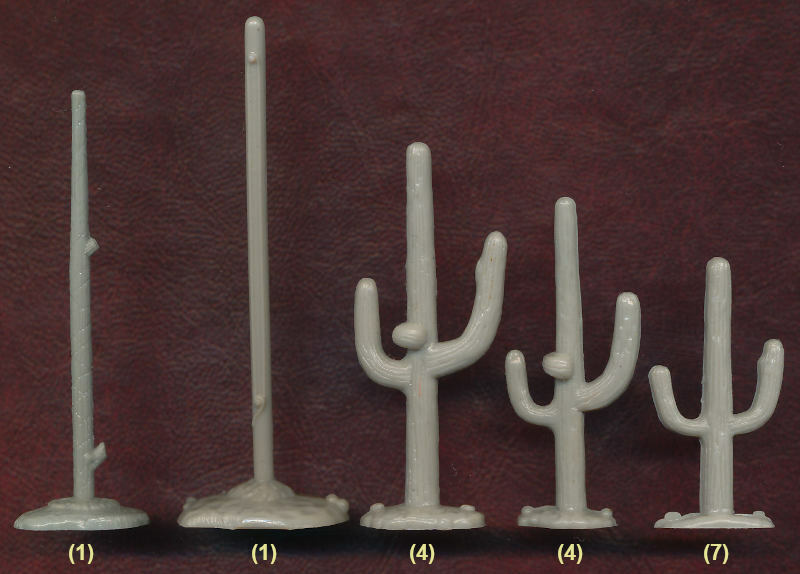 The taller tree reaches a maximum height of 65mm (4.7 metres), and the three larger cacti have heights of 55mm (4 metres), 48mm (3.5 metres) and 40mm (2.9 metres). The two medium length ladders are 57mm long (4.1 metres). All these pieces are very good, with sharp detail, good surface textures and absolutely no flash. Unfortunately the larger cacti, which seem to be saguaro cacti, are only found in Arizona, parts of California and modern day Mexico - none are to be found in Texas, so they are not appropriate for the Alamo itself, though of course these 'Southwestern' items are good for many other scenarios. It would seem that many of the pieces are inspired by items made by Marx. Certainly the variety of ladders and grass is impressive, though to what extent customers will appreciate the number of grassy tufts is questionable.